Sanifix Limited - the UK’s premier national after-sales support company working directly with leading bathroom manufacturers, suppliers and distributors. Wholly independent, guaranteed total confidentiality. Marble and solid surface repairs. Our origins go back to the mid 80’s when theJacuzzi were establishing in the UK and needing dependable after-sales support. Adding to this came the Porcelanosa group of companies in 1996 followed by Vado, Hüppe, Ideal, Adamsez, Dansani, Showerlux, Ultra Finishing, Crosswater, Fiora, Saneux and other top industry names. 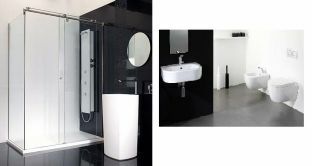 As well as fixed call out cost warranty and non-warranty repairs and spares we offer on-site training where we can take up to 20 candidates for a one day bathroom foundation course, technical issue solving, instruction and installation manual consultation, dispute resolution and product consultation. Our teams have years of experience and specialised training plus our high expertise and standards allow us to be a member of the prestigious Chartered Institute of Plumbing Heating Engineering (CIPHE). Logo’d vehicles GPS tracked, fixed fees, smart, polite, fully trained and security checked technicians and customer services qualified office staff with many years experience. We are happy to discuss any requirement you may have from a single service call, support for your existing team or a full service solution tailored to your needs. spare parts for System-Pool, Noken, Gama Decor and Huppe. Please note that parts not in stock in the UK are special order and we cannot guarantee delivery times. Hüppe shower seals are ordered from a specific 22 digit serial number and custom cut to suit and are not returnable. If we agree to accept returns for these special orders there will be a restocking charge of 25% and return delivery costs will not be met by Sanifix. This is due to the conditions placed upon us by suppliers as we cannot return them. Tebas soft close hinges and standard hinges also available, email for queries. 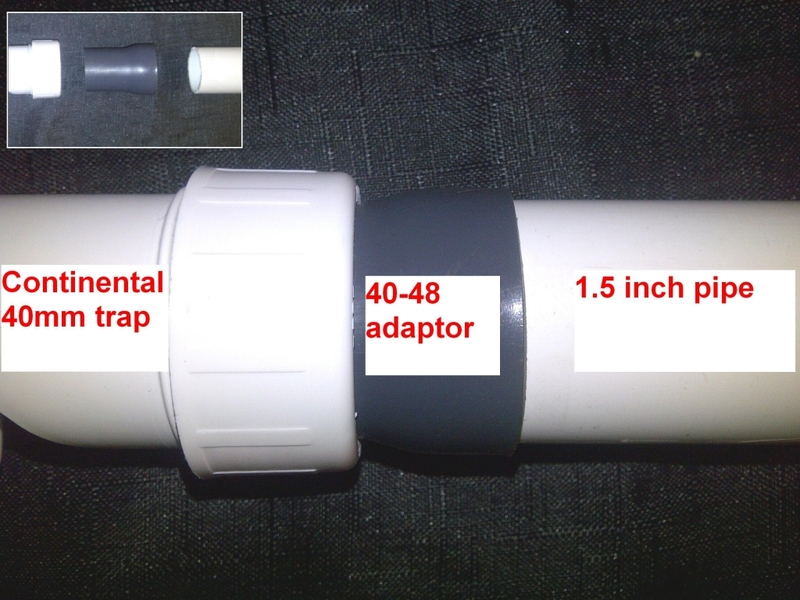 - do you have problems with Continental-type 40mm shower or bath waste fitments? 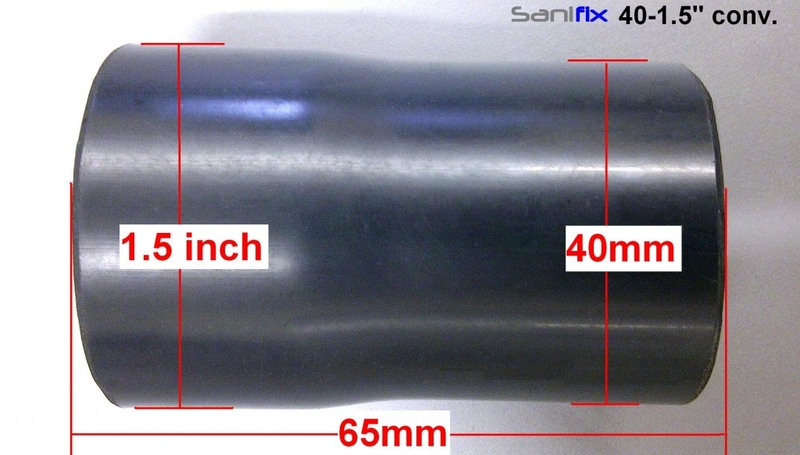 These do not allow UK pipe to fit inside, especially not 1.5 inch solvent weld which is actually 43mm outside diameter. We manufacture and supply a PVC conversion which simply fits inside the European type waste and allows you to UK solvent-weld pipe with no messing about!! Navigate to the 'Conversion Fittings' link for more info. GLUE SOLVENT-WELD 1.5"/43mm PIPE STRAIGHT TO A 40MM WASTE!! We can also tool up to create a quantity of specific size converters - please contact us for information.